AltNewsMedia (ANM) has been investigating the Muslim Brotherhood and how it operates in the UK and elsewhere. It is often claimed that the Muslim Brotherhood (MB) operates on the basis of systematic obfuscation and deception. Many in the West can’t quite grasp that it is always exactly the same snake but with different heads. 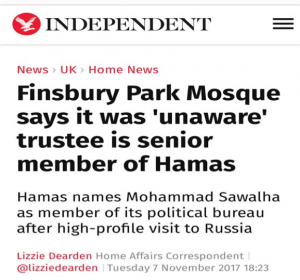 ANM has been examining a specific story concerning the Finsbury Park mosque and the claim that it was ‘unaware’ that a trustee is a senior member of Hamas. This story helps to explain a number of critical points about the MB. Finsbury Park mosque opened to great fanfare in a ceremony attended by Prince Charles in 1994. 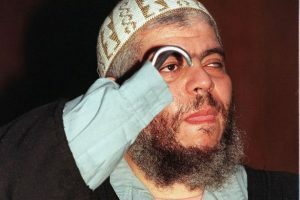 It was run by Abu Hamza from 1997 to 2004, the notorious hate preacher with one eye and a hook for a hand plus his assorted henchmen. Notable attendees were Robin Reid, the shoe bomber and Zacarius Moussaoui a 9/11 plotter. Indeed, when under investigation by MI5 it earned the nickname ‘a London Guest House for Al-Qaeda’. Eventually, after years of preaching jihad (with zero pushback from the congregation), Abu Hamza and many of his henchmen were arrested. Abu Hamza is currently serving life in a US Supermax prison. His hook has been replaced by a combined spoon and fork. After this, in an attempt to change the image of the mosque, the London establishment handed over control of the mosque to a seemingly respectable suit wearing group named the Muslim Association of Britain (MAB). However, the MAB is a subdivision of the Muslim Brotherhood, and the MAB is officially listed as a terrorist organisation in many Arab countries. Just to repeat that; Finsbury Park Mosque is controlled by an organisation banned as a terrorist organisation in several parts of the Islamic world. Hamas is also a subdivision of the Muslim Brotherhood, albeit slightly diverged. Before the 1967 war, Gaza was part of Egypt and there was a local MB branch in Gaza. After Israel took control of Gaza in 1967, the Gaza MB branch simply rebadged itself as Hamas. Exactly the same people! Today, Hamas states that it is “following the path of the Muslim Brotherhood”, so by extension Hamas is a part of the Muslim Brotherhood. Once this is understood, can it simply be a coincidence that a Mohammed Sawalha, trustee of the Finsbury Park mosque (run by MAB/MB) turns out to be a senior political Officer of Hamas (also MB)? Can any person who understands the modus operandi of MB believe that the fellow trustees of Finsbury Park mosque (all MB members) had no idea whatsoever that their esteemed colleague was also a member of Hamas? Labour leader Jeremy Corbyn has found himself in the media spotlight in recent days for making the salute of an Islamist organisation which has been described by a Government inquiry as “counter to British values and democracy”. 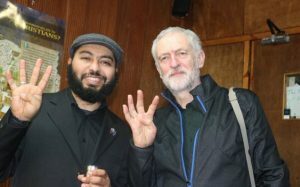 The Labour leader was pictured making the four-fingered Rabbi’ah sign, a symbol of the Muslim Brotherhood, during a visit to – where else? – Finsbury Park mosque! It is not remotely surprising that those running the Mosque give the Muslim Brotherhood signal. They are part of the Muslim Brotherhood. These Muslim Brotherhood charities, mosque associations and human rights organisations operating in the West also serve the purpose of maintaining and developing their infrastructure in the countries they inhabit. The Finsbury Park Mosque trustee position was simply a cover for Mohammed Sawalha. They all surely knew exactly what was happening. But it’s such an easy trick to fool the western media and establishment. Just imagine how they were chuckling after claiming they had no idea about Sawalha, and seeing that the trick worked, yet again. The lack of desire to investigate fully and reveal these truths raises serious questions about both the establishment and the media in general. Muslim Brotherhood organisations (e.g. Islamic Relief UK, Muslim Association of Britain, CAIR-USA etc) are always set up by Muslim Brotherhood personnel (who always seem to have been at another MB organisation previously). Then the same MB people move to another country, are joined by some other MB people and go on to set up a new MB organisation. And so the merry-go-round spins and spins, with a multiple confusing array of different groups of charities, student organisations, mosque associations, human rights organisations and so on. All of them claiming to be independent, yet nearly always set up by MB people once you trace them back. Given that the Muslim Brotherhood and its many surrogates here in the UK are diametrically opposed to the values of our pluralist western democracies, the question must be posed as to why they are allowed to operate in our countries with impunity, if not downright approval? ANM will continue to investigate and shine a light on the murky world of influence of the MB and what it might mean, because if we won’t, who will?